The stock market has just started recovering from its early-February lows—and there are 3 ridiculously cheap funds set to jump even higher while paying massive dividends. Before I show them to you, let’s talk a bit about why the market is set to go higher. There are a lot of reasons for this, but the most important happened in April—just at the start of the upward move in stocks in the chart above. That’s when first-quarter earnings season began, and S&P 500 companies reported 24.9% higher profits, on average, the highest first-quarter growth in history. Earnings are poised to rise at a similar rate in the second quarter. Those profits are driving the economy higher, too. Forecasts for American GDP growth have been upgraded at several major banks around the world—including the Federal Reserve. At the start of June, for example, the World Bank upped its growth expectations to 2.7% for 2018, a big jump from previous estimates—and most analysts agree on what’s driving this growth: jobs, consumer confidence and higher wages. So if Americans are earning more, spending more and getting jobs more easily, we should expect American companies to benefit. But which companies will be the biggest winners? Instead of picking them one by one, let’s look at a few funds that not only choose stocks well, thanks to smart strategies, but also pay out above-average dividends to investors from the capital gains these funds earn. The first fund playing this economic growth right is Source Capital (SOR), which has put a quarter of its assets in big tech companies like Oracle (ORCL), United Technologies (UTX) and Microsoft (MSFT)—three stocks that alone account for 13% of the fund’s assets. Those holdings are up 18.9% in the last year, but we’ve only seen tech begin to recover from its early 2018 weakness—setting us up for more gains ahead. More importantly, SOR trades cheap, which means you get these stocks at a discount. That’s because SOR is a closed-end fund (CEF), a type of fund that often trades at market prices above its net asset value (or NAV), another name for the liquidation value of its portfolio. But right now, SOR’s market price is 11% lower than its liquidation value, so you’re getting these stocks for 89% of what you’d pay if you got them through an index fund like the Invesco QQQ Trust (QQQ), or if you bought them one by one. There is a downside: SOR’s dividend yield is just 2.1%, which is extremely low for a tech CEF. 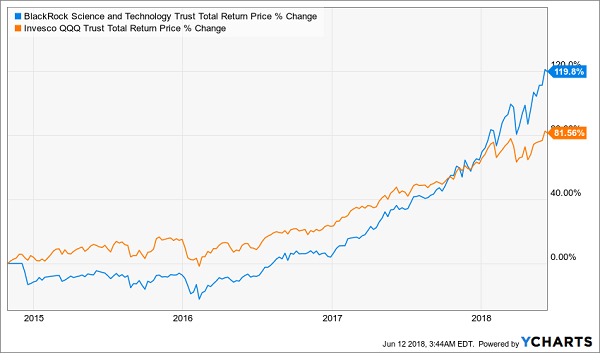 If you want more income and top-performing tech stocks, the BlackRock Science and Technology Trust (BST) might be for you. It yields 4.5%. BST has a dividend yield over 5 times higher than that of QQQ and it’s still able to outperform the index fund by a huge and growing margin. The answer may surprise you: management. BST’s managers have consistently picked winning stocks that outrun the well-known stalwarts of the tech world. What this means is that, beyond the FAANG stocks you’d expect (those account for 25% of BST’s portfolio), the fund’s managers have shrewdly picked and timed purchases in breakout names like top holdings Alibaba (BABA), up 47.5% in the last year; Salesforce.com (CRM), up 53.5%; and Tencent (0070), up 53.6%. That strong track record comes at a price, though; thanks to its market-beating returns, BST has attracted a high valuation and currently trades at a 7.8% premium to NAV. But the fund’s managers have earned that pricing thanks to their market acumen and high payouts—which mean the premium might go up even more in the coming months. If 4.5% still isn’t enough of a dividend yield, or if you want to avoid paying a premium and you want to go beyond tech, I have just the fund for you: the Eaton Vance Tax-Advantaged Dividend Income Fund (EVT), which trades at a 1% discount to NAV and pays a huge 7.5% dividend yield. 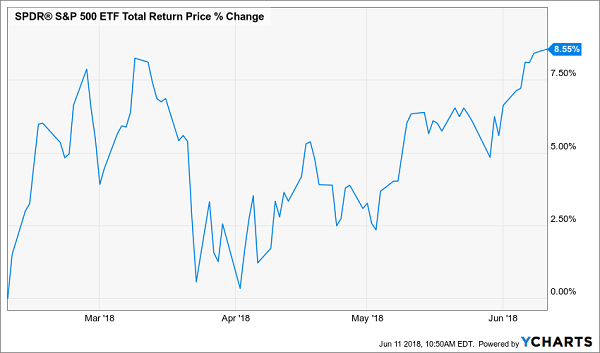 EVT has given investors a solid 14.9% total return over the last year, and its 3.4% total return for 2018 so far is pretty close to that of the S&P 500. That’s not surprising; EVT’s biggest holdings are popular S&P 500 names like JPMorgan Chase (JPM) and Johnson & Johnson (JNJ). This fund is very balanced, with about 10% or less of its assets in sectors such as tech, industrials, healthcare, energy, utilities and real estate. Its biggest exposure is to the financial sector, which is up 19.8% in the last year and set to keep going higher thanks to the booming economy. Also, financial firms benefit from higher interest rates, so this is a savvy play on the Fed’s plans to raise rates this year and beyond. Earn 12% Annual Returns For Life!